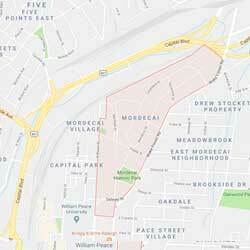 Mordecai is located just north of downtown Raleigh so its close to the amenities without all the busyness. The neighborhood offers quiet, walkable streets lined with trees. Mordecai was developed from the 1900s-1950s and the style of homes include Revival, Colonial and American Craftsman/Bungalow. Mordecai was developed soon after the First World War and the streets were named for the kinds of trees found in the area. Raleigh’s oldest house built in 1785 can be found in Mordecai Historic Park, located in the center of the neighborhood. The Mordecai house was the birthplace of President Andrew Johnson and now serves as a museum. Close proximity to 440 beltline, great restaurants, grocery stores, schools and shopping. Standard Foods which is a specialty grocery store/restaurant; Escazu, a bean-to-bar chocolate factory and Yellow Dog Bread Co. are just a few of the unique local treasures found in Mordecai.